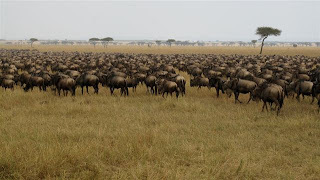 Seriously, when you think of those Savanna grasslands of Africa, what panoramic horizon iconic view comes to mind ? What living organism aside from animals do you visualize ? 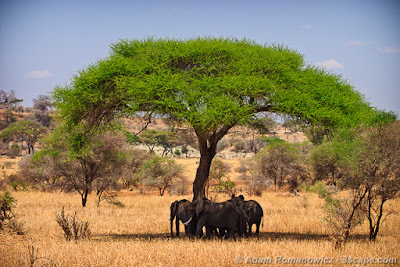 Is it not the Acacia which stands out as the foundation of such a beautiful habitat ? All the Hollywood movies and nature film documentaries ever made have this major iconic African as a major componant of what Africa is. Even if you've never pondered it before. For people over the in the deserts southwest in the United States, our Mesquite and Paloverde trees might recall to our minds similar images from your green living deserts. Plants from the families of Prosopis, Cercidium, Olneya, etc are also members of that same Pea or Legume family with many of the same characteristics and background as the Acacia, some of which are also native to the Southwest. Like Acacia tortilis, they all have in common a very deep taproot for which may go down into the soil almost 200' or more to tap into the water table for which the conventional rain cycling pattern becomes unnecessary for it's continued survival. A number of other natural features and physics phenomena are also associated with this tree as their North American relatives. In the Sonoran Desert we know that the Sonoran Desert Plant Community as a whole is dependent on one another. For example, many plants and other Cacti like the mighty Saguaro are dependent on Nurse Plants to guide them along through youth, This is usually provided by a Mesquite or Paloverde tree. 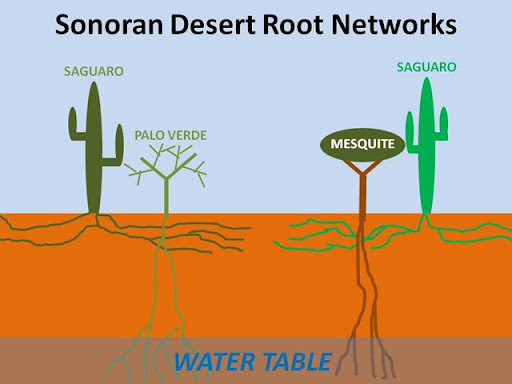 These are deeply rooted, taping into sub-soil water sources, pulling these up through a process we know as Hydraulic Lift and then proceeding to redistribute this water via the horizontal lateral root system which itself is inter-connected to a healthy vigorous mycorrhizal grid or network which has the ability to connect unrelated species via their root system networks. Take a view of the animation below. It speaks volumes. "Hydraulic Lift" (HL) in plants is defined as the redistribution of water from wetter to drier soil through the plant roots in response to soil water potential gradients. 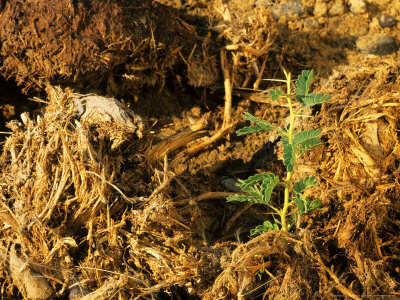 Water is released from the roots into the dry soil when transpiration is low (night) and reabsorbed by the plant when higher transpiration rates are resumed (daylight). On the other hand, the "Hydraulic Redistibuted" (HR)lifted water released into dry surface soil can support growth and survival of the lifting and neighboring plants. Soil and rhizosphere microorganisms and the soil fauna could also benefit from HL-derived water, which eventually increases the availability of nutrients to other plants. But the kicker is the redistribution of that deeper subsoil lifted water to the surface soil layers to be utilized by more shallower rooted plants such as bunch grasses. There are almost 800 species of Acacia shrubs and trees inhabiting the Earth's warmer climates, especially temperate parts of Australia, where the trees are called Wattles. Because of their usefulness in wildlife ecosystems, Ornamental Landscaping and some Commercial Applications, these Acacias are cultivated in many areas where they are not native. But Acacia tortilis would most certainly be their King. So many other plants, including numerous bunch grasses depend on them during drier hot periods of the year by it's ability at utilizing this mechanism called Hydraulic Life & Redistribution. Now take a look first at some components influencing this tree's life cycle and the various animals ability to shape it into various necessary habitats for their own survival. As noted above, the Acacia starts out life traveling through the various digestive tracts of other animals. This allows the stomach digestive acids to break down the hard seed coating which allows water to finally penetrate. This hard coat however keeps it viable for long periods of time. Most commonly it is found sprouting from an Elephant's dung as the seedling below illustrates. This is the same scenario for Mesquite seed germination in the deserts and savannas of the warmer regions of the Southwestern IUnited States and Northern Mexico. Cattlemen curse the spread of Mesquite, but their own cattle love to fine on the sweet pods and therefore help spread the seed in their dung. At this point it is easy to see how vulnerable such a young tender seedling can be. 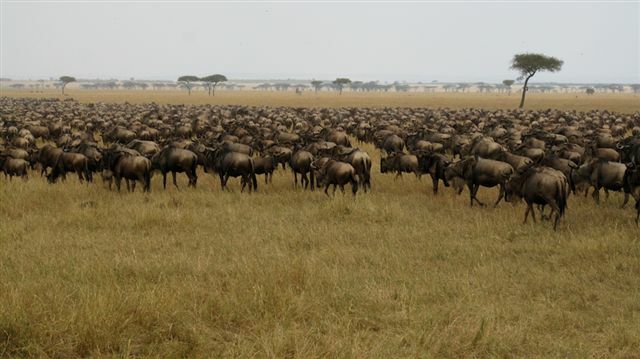 With all those millions of African Herbivores, how can any of them possibly survive ? The most obvious first line of defense of course are those nasty looking spines. But then in most plants of the world's more arid regions need such defenses to protect themselves from herbivores. But the younger Acacias also have Allies - Acacia Ants. One particular ant is very aggressive and an extremely good partner for the plant. This is a Cocktail Ant (Crematogaster mimosae) who provides regular patrolling and rushes to defend the plant when it is disturbed. 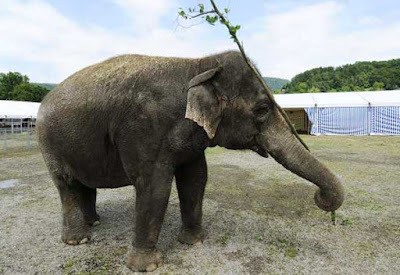 Tree's weapon against elephants? Ants! Let's take an example of the symbiosis found with another type of Acacia and Acacia Ants in Central America. Sometimes called the Bullhorn or Cow Thorn, this plant has a symbiotic relationship with an aggressive and painful species of Ant (Pseudomyrmex ferruginea). The ants live in its thorns and protect the tree from encroaching plants, trying to grow near its trunk or leaves high in the canopy. 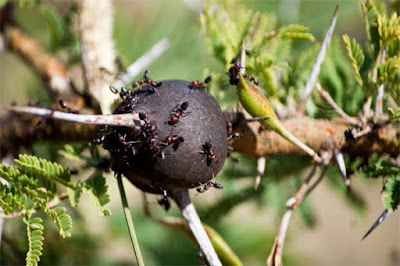 The ants also emerge from the thorns to attack other insects, humans and animals that come in contact with the tree. 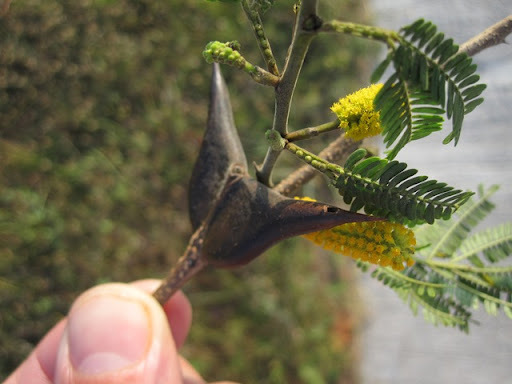 Take note of the enlarged Acacia thorn with the Ant hole entrance below. But now once you get past those young tender years, there are all manner of large Herbivores ready to take their turn on these trees. In an unending ocean of bodies, one has to wonder how any of these trees at all make to a majestic beauty. One way of accomplishing this is by use of bitter poison chemicals sent into the leaves when browsed and they are also able to send an Ethylene Gas signaling message to other trees within a certain 50 yards range to trigger them to produce these same chemical defenses. Though the Herbivores get some foliage before the chemicals do their job, the amount of foliage taken is a mere necessary Barber's trim. How do you think they get that picturesque shape they are so well known for ? That picturesque shape of the Acacia tortilis is created and eventually maintained by giraffes who can still eat the leaves of the Acacia tree, even though the tree has thorns. How ? 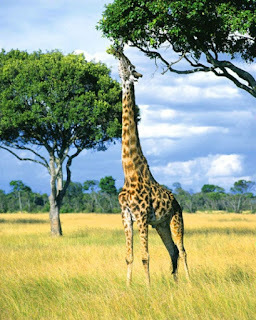 Because the giraffe's saliva has an anti-bacterial property that helps heal wounds in the giraffes’ mouths that may occur from eating thorns. But clearly the Acacia would not be the same without the regular pruning and branch thinning done by these animals. Like so many ecosystems which have long lost their megafauna as a result of agressive human hunting pressure, the Acacia Tortilis would probably be a giant ball from the ground to great heights. Other creatures most likely would not be able to benefit as much from resting under the shade of it's large high umbrella-like canopy. If any or all of the elements for which these amazing foundational trees were eliminated, do you realize what would happen to all the other dependent lifeforms that would simply go missing and disappear forever ?? The rules of nature are changing and humans changed them. Leopards would have no homes for which to use as a lookout post. Even those Communal Weaver bird colonies would need to look elsewhere. Many prove to be extremely large colonies, almost like bird cities. Now do you really want this artificial human artifact to become their new adaptation ? 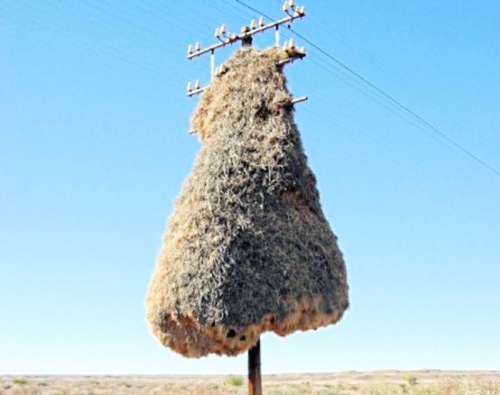 The birds building their nests within human infrastructure like a network of telephones poles just don't have the same romantic wildness about then as an acacia tree. Sure they could all adapt, but they would have to move elsewhere. The greatest benefit still starts with the phenomena of hydraulic lift and redistribution of valuable water resources to all other plants within it's root network of influence. Even in Southern California where I come from, there was an area near Warner Springs CA where in the grasslands where there are single Oak specimens that had the ability to provide moisture to the bunch grasses and other low growing plants within their sphere of influence under their canopy that you see with your own eyes, so it's not that difficult to visualize. In 1981 when I first moved to the Anza California area, I had the privilege to ask questions of the descendants of the very first early ranching pioneers who homesteaded the area who themselves were in their 90s. These people are now long gone now, but not without first telling me something about what the Anza area's natural original landscape was like when their folks first came there to the Valley. The pictures they described were as if from another world. Certainly not what exists there today. They described mostly Oak Woodland Savannas interspersed with various pine species, but mostly Oak on the northern and eastern ends of this extremely large valley. Now presently there is nothing but annaul plants and some native and non native grasses. The reason is that these early pioneers looked upon trees as impediments to their ranching operations which needed grasses for feeding beef. That is how you made a living back then. If they only knew back then the true value of what they had for their livestock foraging under and around oak woodlands. 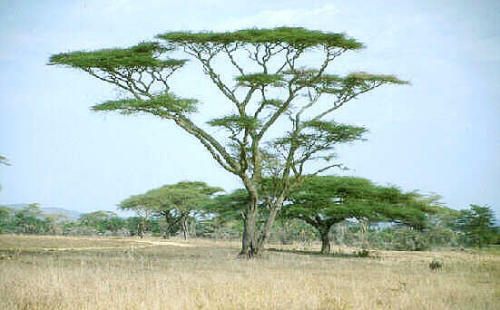 Like the Oaks of North America, these Acacia tortilis provide an important role as a foundational ecosystem tree. Africa now has a horrible deforestation problem which is causing the present problem of desertification of the Sahara Desert moving further south in Africa. The cutting down of all and any trees in some areas for the production and sale of charcoal to be sould and used by citizens of industrialized Europe for a weekend Bar-B-Q. Africa's poor are very desperate the sme as Mexico's poor who also provide Mesquite charcoal from Sonora for Bar-B-Qing Americans is another major problem. 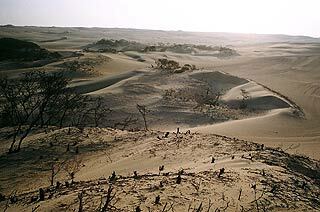 Same scenario in the now moonscape desert regions in South America where the Hurango, Tamarugo and other trees of the Acacia and Prosopis familes once provided an old growth bosque type habitat which better moderated the desert climates and privided water, food and shelter for both people and wildlife have long since disappeared. Eventually the entire Planet will have this Problem ! For those unfamiliar with African outback and bush ecosystems, there are at least some Wild Animal Nature Theme Parks around the globe in other areas which offer glimpses of what such ecosystems look like. Truly such an experience which will inspire anyone to look at the negativity brought to us by media outlets like CNN or BBC News items on the ongoing African plight much differently than they may have considered previously. Then by all means if in San Diego CA, go to the Safari Park. This is an example of an Acacia tree at the San Diego Wild Animal Park or Safari Park as it may be called now. This area is called Thorntree Terrace and is very popular Cafe with the visitors. Incredibly if you watched the development of this tree from it's beginning when it was first planted, you noticed that human hands were necessary and directly responsible for the forming, shaping and sculpting it into what you see today. If in an ecosystem devoid of animals out in the African bush with no interference it may only grow into a more rounded shrub-like in appearance, but let's hope not. Not one of us can imagine the various old growth forested systems the early European exporers first saw prior to the industrial revolution where the misuse and abuse of science was used to exploit the Earth's natural resources. 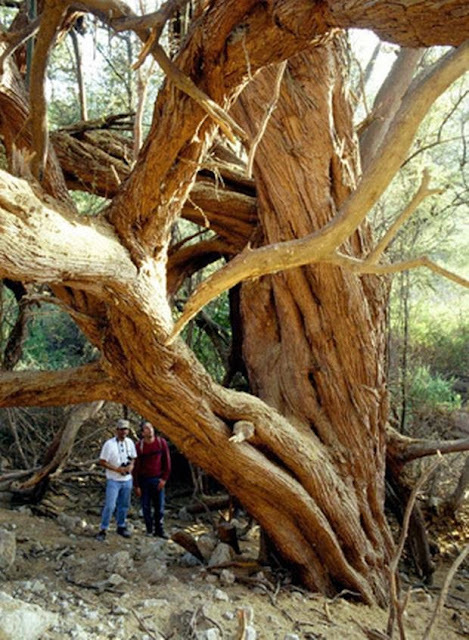 The mighty old growth Hurango (Mesquite family) forests of South America have only mere remnant specimens to provide us with clues of what such ecosystems once looked like. 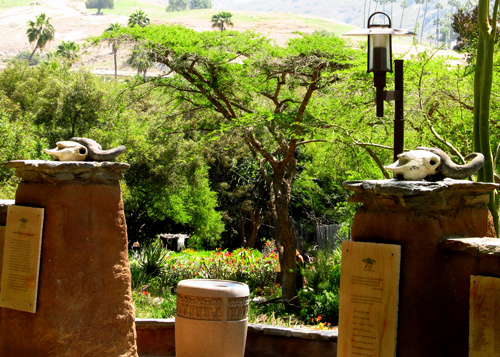 One of my favourite places to walk through at the San Diego Safari Park is a meandering pathway called the African Loop. It offers visitors a glimpse of a world they are extremely far removed from and may never in their life ever visit. The entrance begins here at this map location. Eventually it will take you through the examples of African Savanna Woodlands and all the other companion ecosystems plants of the Savanna on a trail which leads to the theme park's African Oravanko Outpost. As you walk this trail, take photographs, jot down notes or at least take some mental notes of scenes which could be replicated within your own urban landscape. One word of caution, like Africa, San Diego County backcountry has any of a number of nature things that will stick you, stab you or bite you. Notice this common critter my wife & our friend almost stepped on in the photograph at right here ? Seriously it was right between her legs and this photo was taken just after she passed over it. I just happened to see it right before my eyes at time it happened because I was right next to her and yelling or panicking would have actually created an encounter that would have for sure brought injury. I do often ponder that if I'd said something in a startled manner if they would have jumped up and accidentally stepped on the baby rattlesnake. That would have been a disaster. Below are some scenes we took from our walk. I actually wish I had taken more. This is one of my favourite place to be, even more than viewing the animals. Sorry, but the scenery here is lovely. Personally I look forward to a day when all of this world's failed Politics, Religions, Economics (Science) and the general irresponsible dominating of man over their fellow man are done away with. I hope everyone reading here will be able to enjoy a pleasant lifestyle as a result of practical application of healthy values, principles and standards which will truly make this planet a New Earth. That's why the actually blog address here is "Creating a New "Earth." There is no amount of materialist fix here for it to become a reality, no amount of Eco-Conferences or Green Innovations to be forced and implemented on mankind by hard nosed rules & regulations for bringing this necessary change about. This is something in human behavior that will have to be addressed by every individual. In the mean time visualize yourselves enjoying a unimaginable Earth wide Paradise. Try working towards that goal everyday and not just a dreaming about it. The hope is that even peoples of the world's poorest nations will also be able to enjoy on an Earth with more paradisaic conditions! We planted fever trees, but they are not happy. We are losing them one by one. The Rhus/Searsia flourishes. 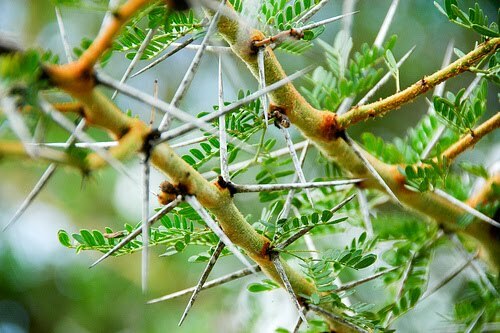 Oh I'm sorry about the Acacia or Fever trees. Things appear to be failing all across this planet. There are other incidents of plant failures now even from the area where I come from. The Rhus/Searsia looks beautiful though. Are the berries edible ? "I saw this really great post today…." Please don't spam these boards with east European Scam sites. Build your own site content for free and hit people with your junk there. Your post had nothing to do with the subject of Acacias. BTW, this east European Spammer has a Google+ account and ( she/he/it/they ) are from the Czech Republic. This is a warning, you will be reported to Google if you do this again.